Several weeks ago Brent Harmes was helping me pick peppers and expressed surprise when I told him that there is no such thing as a ripe green pepper. Apparently there is a sizable portion of the general public that is not aware of the fact that green peppers are indeed green peppers, that is-green as in immature or unripe peppers. I must admit that this is one thing that I have never given much thought to. I had always assumed that everyone knows that green peppers are unripe peppers. The truth is that all peppers if left on the plant long enough, are going to change to some color other than green—red, orange, yellow, even brown or purple. There is at least one variety of pepper that I know of that is a light yellow color when unripe and gradually changes to orange, then red as it ripens. Now this is one thing that I didn’t know until after I started market gardening a little more than ten years ago. There are varieties of tomatoes that are green when ripe! Now isn’t that interesting! I haven’t grown many of them though because I like to see tomatoes change color as they ripen and I also think that there is a proportionately smaller portion of the general public that likes to eat green tomatoes, ripe or unripe. I’m keeping my fingers crossed as I patiently watch for signs of head formation on my purple, orange, and white cauliflower as the end of the 2006 CSA season draws ever closer. I thought I had started them plenty early enough in early June in order to have them ready to cut by late September and early October so I planted a lot to make sure the needs of the CSA and farmers’ market would be covered. I admit that though I had done a good job of protecting the young plants from insect attack while in the greenhouse, they were in the greenhouse too long. However despite the fact that they should have been transplanted at 6 weeks instead of 8 weeks, I still thought that getting them into the ground by the 1st of August would give me plenty of time to have them mature before the middle of October. Then came the devastating August drought and a full scale attack by both imported cabbage worms and harlequin bugs which left me scrambling to merely get them to survive not to mention keeping them on their growing schedule. Well now you have the story. My cauliflower is looking healthy now and growing rapidly, but a good month behind schedule. A similar thing happened to the broccoli; the only difference is that it was groundhogs, not bugs that nearly did it in. 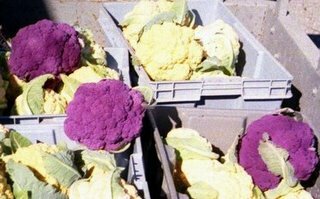 If none of you get to see broccoli and or multicolored cauliflower in your CSA boxes before Oct 17, believe me, it will probably make it barring an early killing frost. You should get an opportunity to buy it from me at the farmers’ market. I still hope to have purple, orange, and white cauliflower along with green broccoli on the table at the same time and if I am lucky, some lime green romanesco cauliflower, the kind with the fascinating spiraling cone shaped heads. It should be beautiful. Please remember to bring back all your empty boxes by the last pickup. I hope to see many of you at the potluck. Oh that reminds me I need to get back to practicing my guitar!